Around 1995, Ontario switched from using predominantly method specifications to end-result specifications. 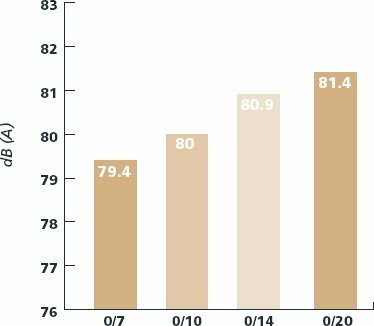 This was envisioned as a transition to long-term (e.g., 20-year) warranties, but this vision did not have the support of the financial industry. MTO is experimenting with performance-based warranty contracts in which the ministry asks contractors to warrant a specific condition level (e.g., greater than or equal to 79 on MTO's 0–100 Pavement Condition Index scale) 7 years after construction. So far, this type of construction warranty has been obtained only for lower-volume asphalt pavements, not concrete freeways. MTO's acceptance for concrete freeways is based on the mean and standard deviation of the lot measurements for core compressive strength, slab thickness, and surface roughness. The contractor may receive a combined bonus of up to 5 percent of the item or a penalty of up to 20 percent. Notwithstanding the overall percent within limits, the contractor is required to repair a sublot if any individual compressive strength or thickness is less than 60 percent of the specified value or if any individual sublot for surface roughness is greater than a specified value. Scallops greater than 0.4 in (10 mm) for concrete pavements and 0.6 in (15 mm) for concrete bases must be repaired by diamond grinding. The contractor uses a computerized California profilograph, which is approved by the owner on an annual basis. Ontario is moving away from the use of epoxy-coated dowels in favor of stainless steel and black steel. Joints in concrete pavements are sealed with rubberized hot-poured sealant in 0.4-in-wide (10-mm-wide) reservoirs. Tining is done transversely, at a 0.75-in (19-mm) uniform spacing. A longitudinal tining trial was constructed on Highway 401 in 2006. Ontario has allowed the use of dowel bar inserters since the 1990s, and still allows both baskets and inserters, though the latter are more often used. In 2006, MTO implemented the use of MIT-SCAN equipment during construction to assess dowel bar alignment on a few trial contracts. Random scanning is done daily during construction, usually within 24 hours after paving. Concrete paving contractors in Ontario also have MIT-SCAN equipment and do their own testing for quality control. MTO's acceptance for concrete pavement on these trial contracts also includes the alignment and position of dowel bars. Data from the MIT-SCAN during production is used to assess bonus or penalty. Québec paves full-width concrete shoulders with concrete pavements and uses preformed sealants in transverse joints in JPCP. Joint reservoirs are not sawn for longitudinal joints. The standard JPCP joint spacing used is 16 ft (5 m). Tie bars and dowels are placed before paving. Québec uses random transverse tining to texture concrete pavement surfaces, but has experimented with exposed aggregate and shotpeened surfaces as possible low-noise solutions. MTQ has used smoothness specifications for all concrete pavement projects since the early 1990s. (32) The Profile Ride Index (PRI) was replaced by the International Roughness Index (IRI) in 1998 so that the same smoothness specification would apply to both asphalt and concrete pavements. Some contractors still use a profilograph for control purposes. Based on a 2000 study comparing different kinds of roughness measuring equipment, the rolling profiler was selected as best suited for construction control. MTQ's smoothness specifications include penalties for inadequate smoothness. MTQ enters into contracts with warranty, or "performance guarantee," requirements with paving contractors. The contractor must guarantee the performance of the roadway for a period of time (5 to 10 years for several contracts let between 1995 and 2005). Annual performance monitoring, including measurement of profile, skid resistance, rutting, and distress, is conducted on 328-ft (100-m) control lots in the traffic lane. Slipform pavers are used to place concrete pavements in Germany, normally in two courses. Old concrete pavements are reclaimed and crushed into aggregate for use in the lower course of two-course concrete pavement slabs and in crushed aggregate base courses. Concrete recycled from old pavements with concrete durability problems (alkali-aggregate reaction or damage caused by freezing or deicing agents) cannot be used in new concrete slabs. Concrete resurfacing work on existing expressways typically must be carried out within short timeframes, and thus severe penalties are imposed on contractors if deadlines are not met. Either batch mixers, with capacities of 130 to 390 cubic yards (yd3) (100 to 300 cubic meters (m3)) per hour, or continuous mixers, with capacities of up to 390 yd3 (300 m3) per hour, are used to produce the volume of concrete (up to 3,900 yd3 (3,000 m3) per day) typically needed for such projects. For single-course concrete paving, dowels and tie bars are placed in baskets. 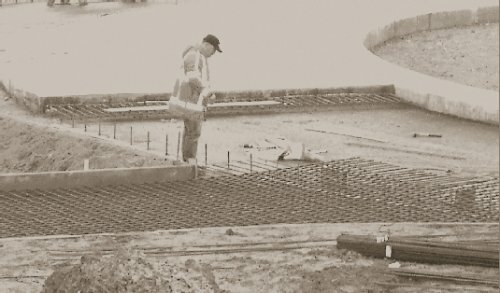 For two-course paving, dowels and tie bars are vibrated into the slab after the first course has been placed, and then the second concrete course is placed. The two concrete layers must be placed wet on wet to achieve full bond between them. Two-course construction may be done using two slipform pavers or with a large single paver. To achieve concrete pavement surfaces with good skid resistance, smoothness, and low noise, the concrete surface is finished and smoothed, and then textured using a longitudinal heavy burlap drag. 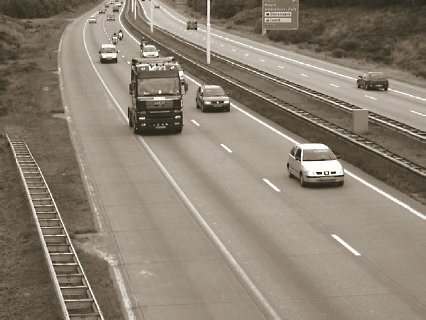 Since May 2006, the standard surfacing method for concrete roads on motorways in Germany has been the exposed aggregate technique, which has been used for many years in Austria and Belgium. (33) The top lift in two-lift construction is 1.6 in (4 cm) thick, and the maximum aggregate size in the top lift is 0.3 in (8 mm). The mix for the top lift has a cement content of at least 26 pounds per cubic foot (420 kilograms per cubic meter), a water-cement ratio of about 0.40, and a gap-graded aggregate composed of 30 percent sand and 70 percent crushed stone. Two surface preparation techniques have been used in Germany for two-lift construction: application of a set retarder combined with a liquid curing compound, and application of a set retarder followed by covering with a plastic sheet. With both techniques, the goal is to be able to brush the surface of the concrete while it is still green to remove the mortar at the surface and expose the coarse aggregates. Transverse and longitudinal joints are cut 0.12 in (3 mm) wide as soon as possible to prevent uncontrolled slab cracking. Transverse joints are cut to 25 to 30 percent of the slab thickness, and longitudinal joints are cut to 40 to 45 percent of the slab thickness. Joint sealant reservoirs are cut 0.24 to 0.6 in (6 to 15 mm) wide and 0.6 to 1.4 in (15 to 35 mm) deep. Transverse joints are sealed with preformed elastomeric joint seals, and longitudinal joints are sealed with bituminous sealant compounds. Cores taken every 10,800 square feet (1,000 square meters) from the finished pavement are tested for strength and thickness, and the smoothness and skid resistance of the finished pavement are also measured. A 13-ft (4-m) straightedge is used for initial smoothness acceptance testing. Concrete pavement slabs in Austria are paved in two lifts, wet on wet, above the base layer and bituminous interlayer. The lower concrete course is 8.3 in (21 cm) thick, made with virgin or recycled concrete aggregates (1.25-in (32-mm) maximum aggregate size) that do not need to be highly wear resistant. The upper concrete course is 1.5 in (4 cm) thick and contains smaller (0.3- to 0.43-in (8- to 11-mm) maximum aggregate size) aggregates with high wear resistance. Figure 28 shows the upper course being placed on top of the lower course. 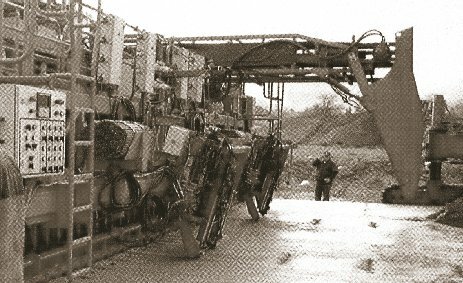 Figure 29 shows the dowel and tie bar inserters on the back of the front paver. The exposed aggregate surface texture is created by a set retarder on the concrete after texturing, followed within 20 minutes by curing compound or plastic sheeting. The mortar is later brushed off the surface with a brushing machine, exposing the aggregate. 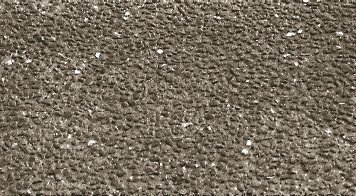 Figure 30 shows an exposed aggregate surface constructed using a 0.3-in (8-mm) maximum aggregate size. Transverse joints are cut before the longitudinal joints, between 8 and 24 hours after concrete placement, depending on the weather conditions. For concrete motorways with concrete slab thicknesses of 10 in (25 cm), transverse joints are sawed 3 in (75 mm) deep and longitudinal joints are sawed 4 in (100 mm) deep. To facilitate drainage of water that infiltrates the joints, flat drainage tapes are placed below the concrete slab at locations corresponding to the transverse joint locations and running from the middle of the outer traffic lane to the outside edge of the emergency lane, as shown in figure 31. Figure 32 shows these drainage tapes placed before paving. CRCP is the concrete pavement of choice in Belgium for motorways, but JPCP is also built. Dowels are 1 in (25 mm) in diameter, 24 in (60 cm) long, and spaced every 12 in (30 cm) across transverse joints. Dowels are coated with epoxy or bitumen. Tie bars are deformed steel, uncoated, 0.6 in (16 mm) in diameter, 31.5 in (80 cm) long, and spaced every 30 in (75 cm) along longitudinal joints. Black (iron-oxide-coated) steel is used for CRCP. Transverse steel in CRCP is skewed 60 degrees. For JPCP, the contractor can choose what type of joint sealants to use. Typically, hot-poured sealants are used in transverse joints and preformed elastomeric seals are used in longitudinal joints. The government typically does all testing during construction, but for some large projects, quality assurance/quality control (QA/QC) approaches are being used. Recent contracts have included pay factors for thickness, compressive strength, smoothness, and friction. The warranty practice in Belgium is to require a 3-year guarantee from the contractor. 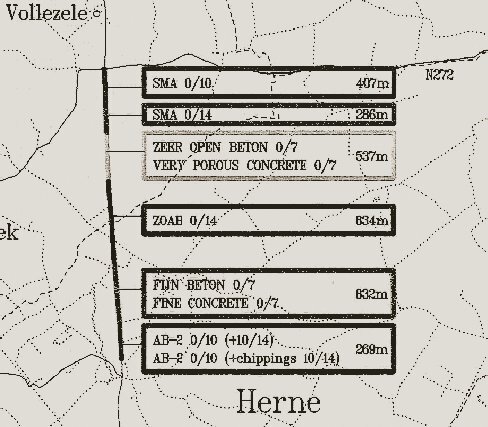 Slipform pavers were first used in Belgium around 1970. 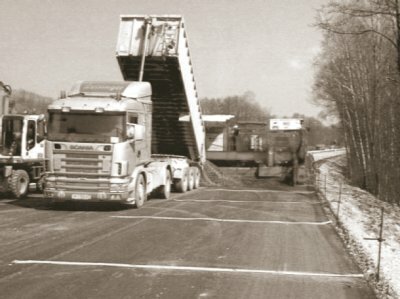 Figure 33 shows the paving of the E34 road between Vosselaar and Turnhout, one of the first slipform paving projects in Belgium. This pavement is still in service 35 years later, carrying more than 40,000 vehicles per day with 12 percent trucks. One of the most prominent concrete pavement projects undertaken in Belgium to date is the reconstruction of the Antwerp Ring Road, one of the most heavily trafficked freeways in Europe. (36) The Ring Road is about 9 mi (14 km) long, with four to seven lanes in each direction. Six radial freeways tie into it, and on its busiest sections it carries nearly 200,000 vehicles per day, with 25 percent heavy trucks. The new pavement is a 9-in (23-cm) CRC slab over 2 in (5 cm) of bituminous interlayer, 10 in (25 cm) of cement-treated granulated asphalt rubble, and 6 in (15 cm) of granulated lean concrete rubble. The CRC slab has an exposed aggregate surface. CRCP was selected based on multicriteria analysis that included consideration of life-cycle costs, noise, recycling opportunities, comfort, safety, and other factors. The reconstruction of the Antwerp Ring Road was notable for its cost, about US$136 million (€100 million), and tight construction schedule. The outer ring was reconstructed in a 5-month period beginning in November 2004, and the inner ring was reconstructed in a 5-month period beginning in April 2005. An A+B contract was used, and the contractor worked around the clock to meet the construction schedule. 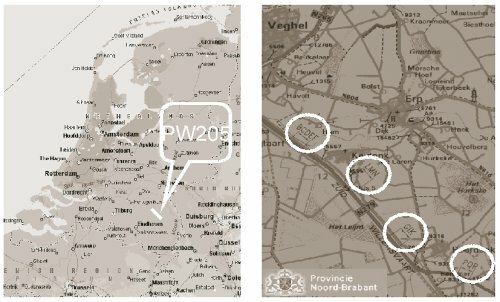 Belgium has constructed more than 50 intersection roundabouts (see figure 34) with CRCP since 1995. They are built with a slipform paver or with sideforms and a vibrating beam. Belgium's first experiences with exposed aggregate surfaces were in the 1970s. Major improvements to the technique, especially in mix design, were made in 1996 after a field study of low-noise surfaces (see figure 35). Six different surfaces were built on a layer of CRCP. The top layers were asphalt, porous asphalt, porous concrete, and fine exposed aggregate concrete. Noise measurements were done on the sections immediately after construction and 3 years later. Initially the porous surfaces had the lowest noise levels, but after 3 years the exposed-aggregate concrete surface appeared to have a lower noise level. In another field test, conducted in 2003, four test sections were constructed within a larger two-lift CRC paving job to compare four combinations of lower lift thickness, upper lift thickness, and upper lift maximum aggregate size. The influence of maximum aggregate size on measured noise levels is illustrated in figure 36. Exposed aggregate surfaces are now used on all high-speed roads in Belgium. On motorways, after the set retarder is applied to the surface, plastic sheeting is used for the first 24 hours and then removed for brushing of the surface. For JPCP, the transverse joints are sawcut through the plastic. For non-motorway construction, the liquid curing compound, rather than plastic, is applied after the set retarder. In Belgium, contractors have been pleased with the results obtained with laser guidance of the slipform paver on some round-the-clock paving jobs and others done at night to avoid daytime traffic congestion. Employees sometimes trip over the stringline during nighttime paving, and this problem is eliminated using a laser system. The Netherlands' practices in CRCP construction are based largely on the Belgian model and by experience gained with successive projects. Sections of CRCP were constructed on the A76 motorway in 1991, the A73 motorway in 1993, the A12 motorway in 1998, and the A5 and A50 motorways in 2004 and 2005. Construction of a 12-mi (20-km) segment on the A73/74 motorway began in 2006. Minor maintenance work is commonly done at night in the Netherlands because of daytime traffic congestion. New construction and major maintenance work are done in the daytime, with full closure of the motorway and alternate routes provided for traffic. The outer shoulder is paved full width to serve as an emergency lane (see figure 37). Tie bars across longitudinal joints in JPCP are 0.8 in (20 mm) in diameter, 31.5 in (800 mm) long, and spaced every 5.5 ft (1.67 m). The steel used for CRCP is uncoated. Standard procedure in the Netherlands is to place the steel at the mid-depth of the concrete slab, although in theory and according to the VENCON 2.0 design program, the steel can be placed at a depth of 35 to 50 percent of the slab thickness. 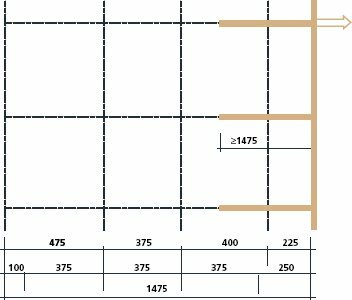 The required 0.7 percent steel for a 10-in (25-cm) slab is obtained using 0.6-in-diameter (16-mm-diameter) bars spaced at 4.7 in (120 mm). Transverse steel (0.5-in-diameter (12-mm-diameter) bars, spaced at 27.5 in (700 mm)) is skewed 60 degrees. Tie bars are used in CRCP only in longitudinal construction joints, not in longitudinal contraction joints. When used, tie bars have the same 0.5-in (12-mm) diameter as the transverse steel, are 31.5 in (800 mm) long, and are spaced every 3 ft (1 m). The tie bars are placed in the fresh concrete if it is paved in two lifts, or drilled in and grouted later. The tie bars for both JPCP and CRCP are covered by a synthetic coating in the middle third to inhibit corrosion. Sealing of joints is not standard procedure in the Netherlands. The typical end treatment for a CRC slab is four anchor beams 5 ft (1.5 m) deep (from the top of the pavement), spaced 23 ft (7 m) apart. At the transition to a bridge structure, the end of the CRC slab is typically separated by the head joint of the structure by a 49-ft (15-m) transitional section of asphalt pavement. A novel "jointless joint" (see figure 38) has been used in conjunction with CRCP at bridge approaches on the A50 motorway in the Netherlands. It is recognized, however, that this is an expensive solution to the CRCP/bridge junction problem. The Dutch standards do not provide definitive requirements for opening to traffic. In general, no traffic or pedestrians are allowed on a concrete slab for the first 24 hours, pedestrians and cyclists may be granted access after 24 hours, cars and other light two-axle vehicles (maximum weight 3,300 pounds (1,500 kg)) are permitted after 48 hours, and opening to other traffic is allowed after 7 days or attainment of 70 percent of the design 28-day compressive strength, whichever comes first. The different set retarding methods, construction methods, and mix designs used were not found to produce significant differences in smoothness. The initial friction level achieved was found to be related to the type of curing compound used. The different aggregate types examined yielded similar initial friction results. A 0.3-in (8-mm) top size quartzite was found to provide the most durable friction properties. Small gradations were found to produce more desirable noise characteristics for both cars and trucks. Although the use of a super smoother reduces texture depth, its contribution to the evenness of the surface was found to be beneficial in terms of noise.